The MoodleMoot Conference is an annual event that takes place every August online via the WizIQ Virtual Classroom. The conference has also been made into a course to help participants receive the ongoing updates on the conference. The course will remain active after the conclusion of the conference to enable participants to exchange views. 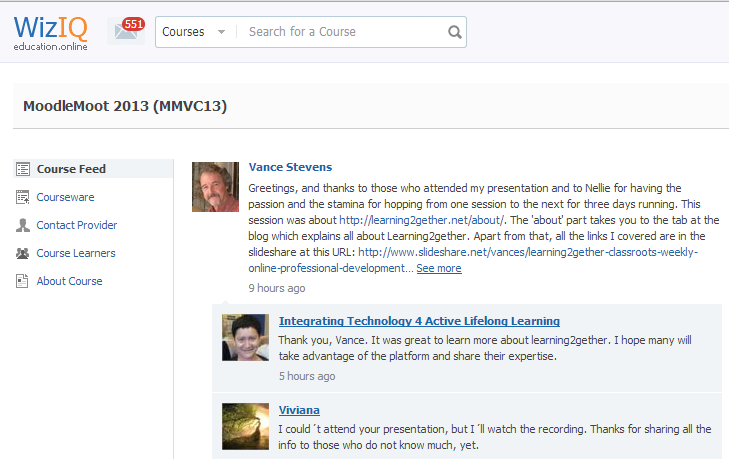 Enroll into the course right away to get updates and join the discussions with other participants of MMVC13. Learning2gether was following other presentations at this online conference, which took place Aug 23-25. We are in a paradigm shift where ongoing learning is moving from the scarcity of what many of us could once only find through degree programs and flying off to international conferences, to the over-abundance of what is available online through MOOCs and webinars and countless online events and communities. This abundance caters to all learning styles, the only seeming limitation being what we can steer our way and then filter so that we can make some sense of the most useful droplets of knowledge streaming from the fire hose. What is abundantly possible is limited only by scarcities in time, energy, and attention. Learning2gether http://learning2gether.net tries to keep a finger on the pulse of some of this activity. In so doing we connect with other networks and communities of networks, including the ones putting on this online event. This presentation will connect with others in these networks and discuss some of the balances of abundance and scarcity that enhance and limit the opportunities we are now finding online. Teaching Blended Online Learning (BOL) using Moodle & WizIQ by an expert e-learning teacher. The presentation will focus on teaching fully online in both synchronous live online classes on WizIQ and using Moodle. Dr. Deutsch has been using Moodle since 2003 and WizIQ since 2007. She has acquired a great deal of experiences in online teaching and trains teachers around the globe. Integrating Technology 4 Active Lifelong Learning added a class.